Goa’s Regional Transport Office (RTO) at Parayantan Bhavan at Patto in Panaji is on the move in more ways than one… full speed ahead with smarter, computerised offices and happier, more polite staff! IT’S all my fault that my driving license had expired six months ago and I didn’t pay heed to it. Naturally with the current zeal being displayed by the RTO cops I’ve been caught riding my bike without a helmet…it’s `100 if you have a license on you and `400 if you don’t or so I learned. For months I’d avoid the main thoroughfare of the Campal promenade because here the traffic cops would be waiting to catch helmet-less riders like me. Day after day I would catch the even more decoratively pot-holed inside roads of Panaji town while going into Panaji town to and fro — and grumble about helmets not being scientifically designed for women! Wearing helmets give me a headache and I’m more likely to crash somewhere because of it! It’s true. In any case with the kind of potholes on roads speeding is an automatic no no and negotiating potholes precariously…how can anyone get into a life-threatening accident at least while in smart city Panaji! I would either forget about my helmet or leave it behind thinking I’m not going out of Panaji anyway. I mean they (the RTO and PWD guys) are trying to solve secondary and tertiary problems without fixing primary problems like decent, safely designed roads and streets, lanes, pedestrian pavements in place, gutters and kerb sides at levels not inviting a slip and a broken ankle…all that. If this were the case I’d happily pay my fines if I am at fault! But here the powers-that-be just want to punish me for their failure to provide citizens with well-designed, maintained roadways. They want to make a killing in fining citizens, that’s all. Never mind that it may be unwarranted, prejudiced and outright criminal. Government can’t provide a decent and safe infrastructure to its people but it can turn everyone into a criminal under the excuse that a helmet will save them from dying on the roads of Goa and adding to the statistics of road accidents which paint them in a poor light…the ironies are endless in what is still a third-world country. But this brings me back to my expired driving license and here I plead guilty. One fine day it was today or never and I rode out to the old RTO offices near the Kadamba Bus Terminal of Panaji, found it in dim shambles for whoever is still holed up here (only the city railway booking offices). RTO director Nikhil Desai has shifted office at Junta House, and the new air-conditioned, well-lit, organized RTO offices (yes, a far cry from the old offices) on the first floor at Paryatan Bhavan at Patto impress with their gleaming computers and digital technology prowess in place. While walking out of the new upgraded RTO offices I appreciate the rows of modular seats, making it easy and comfy for folk if they have to wait for whatever. For a brief while I feel I’m living in a first world country! But this is to say things are moving in government and give or take a few more years…for the better I hope and pray. 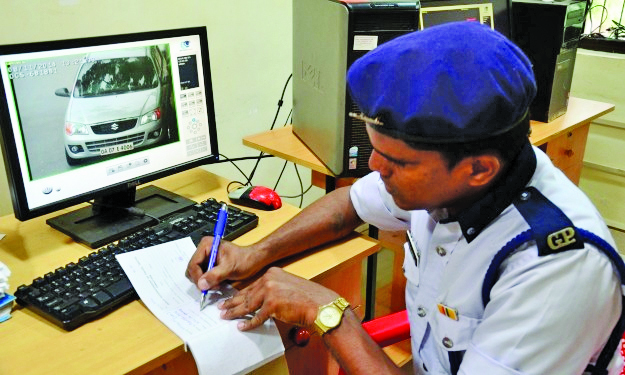 WHICH reminds me to note here that the traffic police have now acquired brand new digital challan machines to do away with tedious, old-fashioned, dog-eared challan slip books…. everything will now go tick-tock into the machine and data will be uploaded to some cloud number seven I presume. Goa RTO is going places for sure, congratulations Nikhil bab! IN a bid to smarten up and make life easier for both RTO police and traffic violators, the public will soon be at the mercy of e-challans! 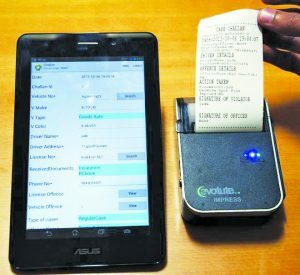 These hand-held e-challan machines are android devices facilitating both electronic delivery of challan as well as cashless transaction of fines imposed for various traffic transgressions ranging from driving under the influence of alcohol or drugs, chatting on mobile phone while driving, driving by minors below 18 years of age, rough or negligent driving and so on. Anything violating traffic rules and regulations…and of course, two-wheeler riders without a safety helmet in place on their head! According to Transport Director Nikhil Desai, each RTO officer will be getting these e-challan machine across all 11 RTOs across Goa. Violators of traffic rules may pay their fine on the spot via credit/debit card or take the challan to the bank and pay. It’s full speed ahead for RTO offices to digitalize and go cashless in a bid to make life easier all around for both RTO staff as well as citizens. Apart from better efficiency, less wastage of time and minimal usage of paper and better presentation all around…gone are the old dingy fusty musty premises and hopefully this will make for better relationships between RTO officers, police and citizens. Graft and underhand wheeler dealing in RTO operations may also vanish like a dream come true.